Infographics key to unlocking marketing success? We live in a world where information is fired at us at a rapid rate – so how can you make your business message stand out from the crowd? A key tool in the fight to attract attention in the digital age is the infographic – a visual means of displaying information or data. It helps you get your message over in a simple, clear and concise way in an attractive format which is easy to read. With computers, tablets and other mobile devices it is easy to skim over much of the content distributed today. There are 6,000 Tweets published every second – that’s 500 million a day. Every minute there are 510,000 comments, 293,000 status updates and 136,000 photo uploads on Facebook. The best infographics transform complex topics or dry statistics into vibrant images that will make people sit up and take notice. Research shows that they are shared and liked on social media three times more than any other type of content. An infographic can encapsulate your message using tables, charts, graphs, words, images and even video. Social media is an ideal environment for an infographic which is simple, creative and visually stimulating and which can be used as part of a marketing. They can draw in potential customers or clients to take an interest in your firm’s marketing message – whatever sector you are working in. They can drive more traffic to your website or help you generate more leads to follow up through interaction. Remember the old adage ‘A picture paints a thousand words’ – still relevant today. 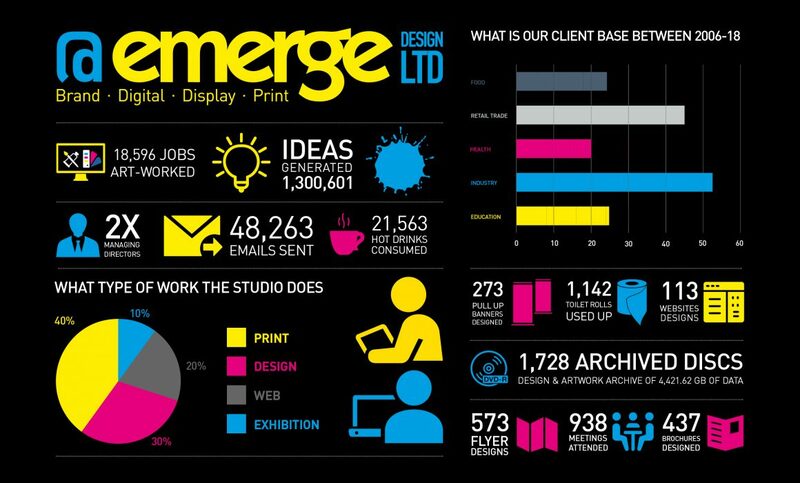 So, why not think about using a striking infographic to get your message out to your targeted audience.